Causality is a fundamentally interesting area for analysts from different disciplines, with applications in the fields of philosophy, psychology, engineering, chemistry, physics, law and humanity. Causality analysis is divided into scientific, religious and philosophical. Religious and philosophical causal analysis starts as early as the dawn of civilization. The scientific analysis comes much later, and can be divided into hypothesis-based analysis and simulation-based analysis. Hypothesis-based analysis focuses on developing tools to identify the causal rules and causal knowledge. Simulation-based analysis focuses more on the possible performance or behaviour patterns created by the causal rules. This paper builds a bridge between hypothesis-based and simulation-based analysis. Decision-making in the field of information systems has become more complex due to a larger number of alternatives, multiple and sometimes conflicting goals and an increasing turbulent environment. Analytic hierarchy process (AHP) has been proposed as a multi-criteria decision technique in many industries, including technology for the assessment of decision support systems. An analytic hierarchy process (AHP) can be applied if the decision problems includes multiple objective, conflicting criteria, incommensurable unit and aims at selecting an alternative from know set of alternatives. 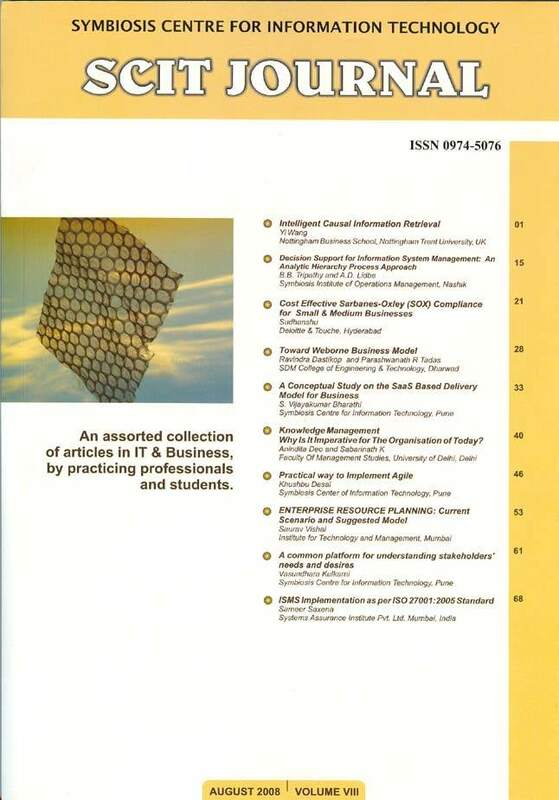 This paper presents an AHP to support information system management for decision making. Information system management is considered to be a complicated multiple criteria decision making problem. This paper is explored the appropriateness of AHP to support information system management decision in general. By using the project selection as an example of complex information system decision it has been shown how AHP support decision-making. This AHP facilitates decision-making process in information system management and similar planning setting. In recent years, the world has been shocked by several cases of serious corporate fraud. Companies such as Enron, Worldcom and Ahold misstated their financial statements and damaged stakeholders’ overall confidence in investing. To regain trust in companies and their financial reporting, the Sarbanes Oxley Act (SOX) was enacted in the United States in 2002. Beginning in July 2006, all non-US-based companies listed on a stock exchange in the United States must fully comply with that legislation.This paper aims towards making SOX Compliance cost effective for SME. Once this background was clear, the task comprised of understanding the SOX process in some of the organizations which are en-route to becoming SOX compliant. This finally resulted in preparing a template based methodology for Small & medium businesses towards being SOX compliant. Using this methodology, SME can become SOX compliant in a very efficient and time-effective manner. The explosive emergence of the WWW as a growing repository of resources- publicly accessible infrastructure and resources (PAIR) makes it a basis for design, development and deployment of new business model Weborne. Weborne business model enables the building of a new genre of enterprises that are entirely built on the basis of freely accessible web resources. In this paper we introduce the concept of Weborne business model and describe its framework and implement it for a selected domain. Our contribution is three fold: (1) concept of a weborne; (2) designing of weborne framework and (3) illustrating Weborne implementation with an example pertaining to Indian higher education. The working implementation of Weborne model can be viewed at http://edusense.googlepages.com. One of the important decision points that have a strategic implication in an organization life is the decision on its IT-enablement. This term encompasses the end-to-end IT infrastructure in the form of hardware, software, network, security and people to support the company growth initiative. However, the challenges of affordability, lack of expertise, misalignment of IT strategy with business strategy had all contributed towards the downfall of organizations, in the past. This paper is an attempt to conceptually analyze the business impact of Software as a Service (hereinafter referred to as SaaS) which is a new delivery model where companies pay not for owning the software but for using it, thereby attempting to minimize such ill-effects. This paper approaches the concept from two viewpoints, first it tries to gospel the evolution, features, the market scenario for SaaS model and then also caution the readers on some of the inherent challenges and publicly believed myths about SaaS. Knowledge Management–Why Is It Imperative for The Organisation of Today? The dynamic world of business with its ever changing markets and constant technological advances calls for an increased focus on knowledge to facilitate value creation process. Knowledge has increasingly taken on the role of an organizational driver, the starting point for value creation and a new factor for production. Knowledge is the basis of innovation which is the driving force behind long term competitive advantage. Hence to ensure the profitability and longevity of a corporation, the role played by KM is pivotal.In this paper, we propose to give an introduction to the world of Knowledge Management and then analyse the factors which make it imperative for a organisation to invest in KM today. In software industry, there are discussions on how to adopt agile software development? What should be the path and strategy which would help to implement agile development in an organization successfully? As requirements of the customer changes continuously, agile software development methodology provides a pragmatic way to build solution which could easily cope up with the customer requirement. This paper talks about a practical way to adapt and implement agile in an organization. It describes benefits, different agile methodologies and challenges faced while adapting agile. This paper theorizes the development of a conceptual ERP adoption model applicable to the midsize business environment. The general business factors associated with ERP systems implementation and the Commensurate organizational benefits are identified. The paper highlights the constraints on resources that confront the midsize business sector when faced with the need to adopt ERP systems. This need can occur as they are attempting to be more competitive, or due to pressure to adopt ERP systems from larger business partners. The theorized conceptual model will use a strategic approach to ERP adoption for midsize businesses. This paper focuses on identifying the organizational, technical and people domains that influence the adoption of ERP systems by midsize businesses. A methodology roadmap is proposed that documents quantitative and qualitative data collection stages, allowing a progressive development and refinement of the ERP adoption model for midsize business. Requirements Engineering is a key activity in the development of software systems and is concerned with the identification of the goals of stakeholders and their elaboration into precise statements of desired services and behavior. Study shows that majority of the software development projects fail because of lack of understanding the requirements clearly and non-involvement of key stakeholders. For the successful software product to be developed it is important to identify relevant stakeholders and involve them during requirements elicitation process. Conflicts in requirements of different stakeholders are bound to happen. These conflicts have to be negotiated and balanced in order to develop a competitive software product.This paper proposes a conceptual model to capture and prioritize relevant stakeholders in a project, determining who and how important they are, provide a common understanding for stakeholders involved, together with the requirements, functions and systems of the product being designed. Recent changes in the Information Security industry have highlighted the need for organizations to protect their most valuable asset – information. The objective of this white paper is to provide the reader with the necessary framework for implementing an Information Security Management System based on ISO 27001:2005 (a well-known global Standard) for their organisation. Another aim is to provide readers with the necessary skills to understand ISMS theory and to develop better understanding of identifying key implementation areas, documentation requirements and pitfalls to avoid during ISMS roll-out across the organisation. This document is for those who are implementing or planning to implement the ISMS Standard. Like the ISO/IEC Standards, the steps in this document are generic and needs to be tailored to specific needs of an organisation. This is not a substitute for reading and studying the two Standards themselves.